Galaxy (navy) blue short-sleeved shirt, with a regatta (pale) blue winged collar. Rectangular insert beneath the neck, with a single lower galaxy blue button, edged in regatta blue, fastening to an overlapping insert. Large embroidered emblem on left breast, alongside neck insert. Embroidered galaxy blue star above the emblem. Lower-case 'v' in regatta blue below the emblem. A white scroll, outlined in regatta blue, below the 'v', with the opponent's name in capitalised regatta blue lettering within it, and the year in regatta blue below the scroll. Two embroidered white concentric diamonds on right breast, alongside neck insert. Regatta blue number on reverse and on right breast below the Umbro logo. Surname in capitalised regatta blue lettering above number on reverse, in same font as the numbers. Regatta blue shorts, with galaxy blue drawstring. Plain white number on left thigh in same font as on shirt, with two white concentric diamonds underneath. Embroidered emblem on right thigh. Galaxy blue socks, with regatta blue tops. Against Norway, England's captain, Steven Gerrard wore a white armband with the emblem, a lower-case 'v' in blue below the emblem, a white scroll, outlined in blue, below the 'v', with the opponent's name in capitalised blue lettering within it and the year in blue below the scroll. The armbands worn in the European Championship qualification fixtures by John Terry, were yellow against Bulgaria and blue against Montenegro, and featured the UNITE AGAINST RACISM logo. In the final tournament against Sweden, Steven Gerrard wore a yellow armband which featured the UEFA RESPECT logo, whilst against Poland, he wore a plain white armband. A long-sleeved version of the shirt was also worn, though a number of players wore a navy blue base layer underneath, instead. There were no distinguishing features on the lower sleeves. The shirts worn by Ashley Cole, and Adam and Glen Johnson also included their first initial i.e. A. COLE, A. JOHNSON and G. JOHNSON. Alex Oxlade-Chamberlain only included his paternal family name (CHAMBERLAIN) on his shirts. For the two European Championship qualification fixtures, England had logos embroidered onto the upper sleeves. The UEFA EURO 2012 QUALIFIERS logo was on the right arm and the UEFA RESPECT logo was on the left arm. Against Sweden, a different UEFA EURO 2012 logo was embroidered onto the right sleeve, whilst the UEFA RESPECT logo was again on the left sleeve. Against Poland, England had the 2014 FIFA WORLD CUP BRAZIL QUALIFIERS logo embroidered onto the right sleeve and the MY GAME IS FAIR PLAY FIFA logo on the left sleeve. The names of England's opponents, as they appeared in the scrolls, were BULGARIA, MONTENEGRO, NORWAY, POLAND and SWEDEN. 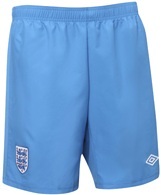 England wore an alternative pair of galaxy blue shorts against Sweden, with a regatta blue drawstring, a regatta blue number on the left thigh in the same font as on the shirt, two white concentric diamonds underneath and an embroidered emblem on the right thigh. 28 players wore this shirt. Cole was the only player to complete four full games in this shirt. 4 players made their international debut in the shirt. Alex Oxlade-Chamberlain had made 32 appearances at the end of 2018, whilst Martin Kelly appeared for, just short of, seven minutes (including added time) against Norway. Gareth Barry was the only other player to make his last international appearance in the shirt. It was his 53rd over a period of twelve years. 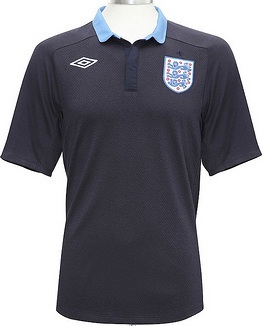 Cahill's goal was his first for England, and also the first scored in this kit. Bent's was his fourth and last for England. Carroll's stunning header against Sweden was his second and last for his country. Walcott then came on as substitute to equalise against Sweden with his first international goal since his 2008 hat-trick in Croatia. Welbeck then settled the issue with a brilliant back-heeled winner. After Terry was relieved of the armband, amidst his court case for racial abuse against Queen's Park Rangers' Anton Ferdinand, Gerrard was Hodgson's choice to take England to Ukraine and beyond. Following the previous year's unveiling of the red away shirt by a rock band in a Paris theatre, this shirt made its debut at the home of Hamburger SV (the Volksparkstadion) in Germany on the occasion of a world championship fight. On 2nd July 2011, David Haye, the WBA heavyweight boxing champion, walked into the sold-out arena wearing this shirt, before his unification bout with the Ukrainian world champion, Wladimir Klitschko. Sadly, he lost the fight and Umbro's ambitious promotion of, what was to be, their last England away shirt, backfired. Nonetheless, it was still a spectacular break from tradition to introduce a blue kit of a shade not previously used by England. It was only used for five games, the most memorable of which was a five-goal thriller in Kiev, when England came from behind to knock Sweden out of the European Championship in a one-off all-galaxy-blue version (though the Under-21s also wore the single-coloured outfit in Azerbaijan). England wore the all-galaxy-blue kit, against Sweden. England: B.Amos, A.Wisdom (A.Smith), J.Bennett, Jack Rodwell (Alex Oxlade-Chamberlain), C.Dawson, N.Baker (Steven Caulker), D.Gosling (G.Gardner), Ross Barkley (C.Wickham), M.Sordell, Jonjo Shelvey (H.Lansbury), M.Waghorn (N.Delfouneso). England: B.Amos, Martin Kelly, Danny Rose, J.Lowe, Steven Caulker, C.Dawson, Wilfried Zaha (B.Marshall), Jordan Henderson, M.Sordell (C.Wickham), Jonjo Shelvey, T.Ince (N.Delfouneso). England wore the all-galaxy-blue kit, against Azerbaijan. A shirt issued to Stewart Downing against Bulgaria.